WARNING: This article has ending spoilers, so you have been warned. It’s more than two decades old, to be fair. Imagine you had a decent job. Let’s say you were the manager of something… a plumbing firm, for example. You make good money, and you’re happy with the knowledge that when it comes to managing plumbing firms, you know your onions. Now imagine you’ve also got two older brothers. One brother is a leading politician – be that the Prime Minister, President, whatever it is in your country. The other brother is one of the greatest footballers in the world and has two World Cup Winner’s medals in his large trophy display room. If you can’t tell where I’m going with this analogy you might as well close this window and go back to fumbling over Candy Crush Saga. Yes, friends, what I’m saying is that Alien 3 is the plumbing firm manager of the Alien series. Look, just go with it. The film begins right after the events of Aliens, with Ripley, Newt, Hicks and android chum Bishop escaping the Alien-infested colony planet LV-426. All is not well, though, because a Facehugger has managed to smuggle itself onboard too. Triggering the ship’s emergency alarm, the four are dropped inside an escape pod onto a nearby planet. When she comes to, Ripley is told by the planet’s inhabitants that Newt and Hicks are both dead and Bishop has been completely broken. To make matters worse, the aforementioned inhabitants are all prisoners. You see, Ripley’s landed on Fiorina 161, a prison planet where the entire population consists of males. And they haven’t seen a woman in a while. Not that this becomes much of an issue when it quickly emerges the stowaway Facehugger has managed to get inside the prison complex, planting its seed inside a dog and creating the first dog Alien. It’s time, then, for Ripley and the prisoners to stop their grinnin’ and drop their linen’, except this time there’s no linen to drop… by which I mean weapons to fire. After all, being a prison planet populated by murderers and rapists, it was decided it probably wasn’t wise to leave firearms around. That’s all well and good for stopping a violent chap taking it to the next level, of course, but it isn’t too useful when there’s a xenomorph dog looking to clamp both sets of jaws around your dangly bits. With this premise, Alien 3 feels indecisive. It feels like it couldn’t choose whether to offer an experience similar to that of Alien or Aliens, and so decided to combine both. By returning to the simpler formula of a single creature and no weapons to fight it with, it initially seems to be leaning back towards the more tension-filled atmosphere of the first film. However, Alien‘s atmosphere was also partly down to the small crew (each of whom who you cared about) and the fact it took place in a relatively small ship. By sticking it in a massive prison complex and chucking a load of meatheads in there, parts of it start to feel like the more action-focused sequel Aliens instead. The result is the inevitable jack of all trades and master of none, with a film trying to combine the slow pace of the first film with the action of the second and ultimately failing to nail either. Not that fans of the series will feel catered for, anyway. Before the opening credits have even finished rolling (preceded by a brilliantly creepy alternative version of the 20th Century Fox fanfare), we’re told of the deaths of Hicks and Newt, characters we’d just spent nearly three hours getting to know in the last film. Having Ripley then perform a fairly gruesome autopsy on this young girl we were once eager to see survive is the final insult, and a pretty disturbing scene to watch. This “up yours” to the fans aside, Alien 3 isn’t too bad. Without the talent of Ridley Scott and James Cameron, and with then-newcomer director David Fincher constantly fucked around by the studio (more on that when I review the wildly different director’s cut), the result is nothing more than a sci-fi slasher film with an Alien playing the role of Freddy, Jason or Michael. And you know, that’s perfectly fine. The only time things really fall apart is during the third act, in which the remaining prisoners decide to try trapping the Alien by leading it to a giant piston then pouring hot lead onto it. 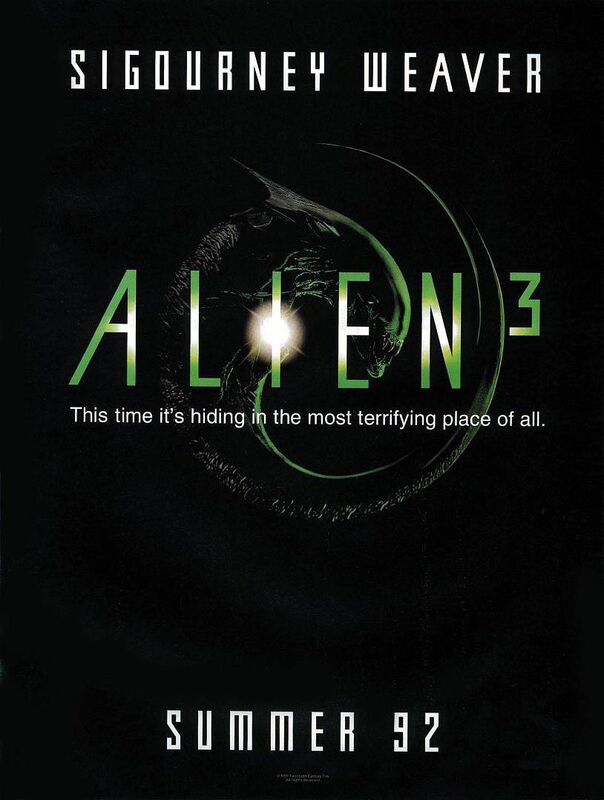 This results in a messy ten-minute segment in which the Alien is led through a complex relay system of prisoners who let it chase them one at a time (complete with overuse of a first-person Alien viewpoint) as they lock doors along the way, forcing it towards the piston. With all these similarly bald chaps running around hollering corridor numbers at each other, you quickly lose track of what’s going on and have no idea if their plan is working or not (other than the obvious rule of thumb: if it’s eating one of them, then it probably isn’t). Once the Alien is disposed of, the film finally redeems itself with a brilliant ending in which Ripley, having earlier learned she’s carrying a chestburster, launches herself into a furnace, incinerating both her and the Alien sprog so the evil Wayland-Yutani corporation can’t use it for bio-weaponry research. Alien 3 may not be the greatest Alien film ever, then (far from it), but it’s still a half-decent sci-fi film in its own right, with a brave ending showing that our heroine is willing to make the ultimate sacrifice to save the rest of the world. And with Ripley now dead, it brings a decent close to the series, drawing a line under it all. As with the rest of the films in the Alien series, there are loads of ways to see Alien 3. You can get the DVD on its own here or get it as part of the excellent Alien Quadrilogy boxset here. You can also get the single Blu-ray edition on its own here or – and, again, this is what I recommend – as part of the Alien Anthology Blu-ray collection which can be bought for stupidly cheap here.